In a deep bowl or dish, add squid, onions, ginger, garlic, spice powders, flour, curry leaves, lemon juice, yogurt and salt. Mix them throughly till the squid is well coated and let it marinate for at least 1 hour or more if possible. Heat oil and empty flour onto a tray and lightly dredge the squid lightly taking care not to overcoat the squid. Drop the squid into the oil and fry them till crispy. Fry only a few at a time to cook evenly. Garnish and serve them hot. 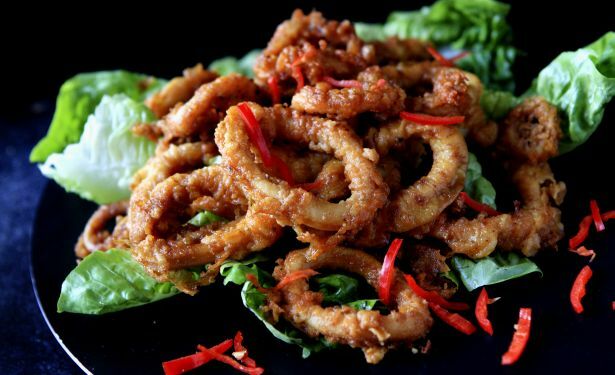 Note: You can also opt not to dredge the squid in flour and fry them immediately after marinating them.